Thank you for the Gazette. I just love the color photos on the cover. You make those rats look like movie stars. I've always had a pet rat, but now discovering all the fancy rats, I find myself with over 30 pets. I advertised here in the city and made many new friends. Now, every other month I hold a rat party. People come over with treats for my pets and we take pictures in the midst of rat heaven. I'm sending you a picture of me and some of my boys. Last year I got some Nile rats, but I do not know the scientific name. Does anyone have any information on them? Editor's Note: I'm sorry I don't have any information about Nile rats. I have never heard of them. Most exotic animals are illegal to keep in California, so we rarely get information on the really exotic ones! I'm still enjoying the Gazette as much as ever, and finding it informative and fun. I loved the article on naming rats in the last issue (Shakespeare Never Had a Rat) - it struck a chord with me because we recently had to name 10 of the 12 babies one of our girls had. We managed it, but there's a lot of references to coat patterns in there! I greatly enjoy your magazine and lok forward to the arrival of each issue. I love the color covers and great photos. My 17 rats are doing well, though one Hairless boy caught a toe in the mesh of his cage and squashed it a bit. It seems to be infected and I've been putting iodine on it. If it doesn't clear up soon, I guess a visit to the vet will be needed. My first rats all came from local pet stores. Then I found a pregnant Hairless in Toronto. I kept two of her boys and then this past December I flew in six fancy rats from a fellow subscriber in British Columbia (Rex, Blue, Siamese, and Odd-Eye). I'm not sure if I dare doing much breeding as there is almost no market here for pet rats and I'm not willing to sell any as feeders. Six weeks ago I put five Hairless babies on consignment in a very busy pet store and only three have sold. These are probably the first fancy rats ever in a pet store in our province. I have never seen any here at all. I take great enjoyment in my "kids" and have to get my rat communication fix through your magazine and other American newsletters. I also have a couple of pen pals as there are no Canadian clubs. Editor's Note: I'm sorry to hear there isn't a better market for pet rats in your area and that you have no club. But, I'm very happy to hear that you refuse to sell rats as feeders. Unfortunately, I believe you're the only RMCA member in your province as well, so starting a chapter would probably be out of the question. Your article, "Alternatives to Culling", is the kind I had envisioned more of when I joined the NRMCI. I enjoy reading about how members save rats, and pieces like yours are the perfect antidote to those from culling proponents. As you indicate, responsible breeding is a must when one considers what happens to rats who are not adopted as pets (especially albinos). Of course, from other letters I have read in the NRMCI Journal, it would appear that some members are not bothered about a "final solution" for animals that do not meet certain appearance or behavior expectations. Although I have not seen any of the rats mentioned in those articles, I am always saddened by such stories. I find the rationalizations--not enough space, not a good specimen, not well-behaved, etc.--unconvincing. I believe that there is always room for another rat. Even a biter, such as my own Mr. Mean, can be amusing when attacking a piece of bread or presenting challenges at cage cleaning time. 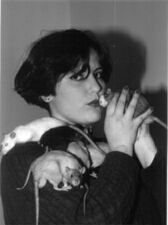 I own 85 rats, approximately half of which were "rescued" from feeder tanks in pet shops. The others are offspring of some of the would-be feeders. With the majority approaching two years old, I do not plan to breed any more of the current population. Some of my best pets, like yours, would have likely been python fodder if I had not purchased them. One of my favorites, Aeschylus, is an albino. He was skittish at first, but now loves to ride on my shoulder and lick my hand. Of his remaining 14 sons (three died of natural causes) 13 live in two large colonies (Mr. Mean lives alone), and his 13 daughters live in a colony with their mothers and an adopted Hooded sister. Almost all of the second generation are standard albinos, but one male is a Himalayan Rex. My daughter's rat, Mousey, is a skinny, off-white runt who has surprised everyone by remaining healthy over her two years. She is antisocial toward her own kind, but loves humans. I nicknamed her the People's Rat. Keeping such a large number of rats has been expensive and time consuming, but I find the satisfaction of doing so well worth it. Culling never was and never will be considered. Editor's Note: Thank you, John, for that lovely letter. It's so nice to hear that other's feel the same way I do about culling. I wish we could eliminate the practice from the fancy completely! Just received the May/June issue of the Gazette, and, as always, loved it. The Furry Friends Orphanage is a wonderful idea. I myself am up to 40 rats - 38 are rescues. There is an RMCA member here, Dayna, who does rat rescue also. Hopefully, we can get more members to open up their homes to rats in need! I have a request. Is there any way to get Craig's "Pet Owner's Creed" put into poster form? I think it's a must on every rat room wall! Editor's Note: Glad to hear you're rescuing, too! We've talked about putting the creed on a poster with the Furry Friends Orphanage logo. Would that do?